The kallikreins are a group of serine proteases known as kininogens, which act on plasma ^-globulins to release kinins such as bradykinin. Bradykinin is the most potent vasodilator substance known. The kallikrein-kinin system is linked in the endothelial cell to stimulate the production of another vasodilator, the prostacyclins. 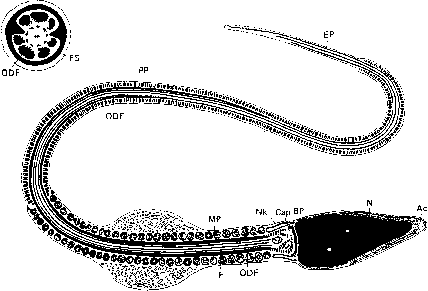 Two classes of kallikreins have been identified: (a) those present in plasma and (b) those present in organs, including the kidney, salivary glands, and pancreas. The plasma kallikreins have molecular weights of 110,000 and 70,000. All of the kallikreins are serine proteases. The plasma kallikrein is normally found as a proenzyme termed prekallikrein. Prekallikrein is activated to kallikrein by one of the blood-clotting factors, factor XII, or Hageman factor. In turn, Hageman factor is activated by the plasma kallikrein (see Figure 15-15). The kallikreins utilize their protease activity to release peptide kinins from their precursor substrate forms. The principal kinin is a nonapeptide bradykinin. The bradykinin receptor, which is principally associated with endothelial cells, has been cloned and found to belong to the seven-transmembrane G-protein-coupled receptor superfamily. The potent vasodilation properties of bradykinin are largely due to its stimulation in the endothelium of prostaglandins and nitric oxide (see later discussion). It is noteworthy that the principal mode of inactiva-tion of bradykinin is the removal from the COOH-terminal of a dipeptide by an enzyme termed kininase II. The enzymatic activities of kininase II and the enzymatic activities of angiotensin I converting enzyme (ACE) have shown them to be the same protein. Thus, ACE, which generates the potent vasoconstrictor, angiotensin II, inactivates the vasodilator bradykinin.